Yes, we are definitely animal lovers! In this special report, we will share, as promised, information from our daily (usually from 6:15 am until 7:30 or 8 am) walk on the beach and discussions with others who walk at the same time, usually with their miscellaneous dogs. Also, we want to share with you a delightful discovery we made up north on the Atlantic coast, a great find for animal lovers! You get the idea. People like dogs here. Enter the president of our own Board of Directors in our tower: a Canadian expat and not a lover of dogs. Due to the fact that we have a couple of pretty old dogs in our building and those guys once in a while have an accident in the garage or in the grassy area on the way to the beach, our board has issued a mandate that all dog owners now carry their animals out to the road or to the beach. Feature this: We leave our condo and enter the elevator on the 22nd floor. Down in the lobby, we must still walk through the garage, past the pool and activities area, through another building (and we always take the stairs, not the elevator), through the garden area and out through the front gate to the beach! Now, Duke is only 28 pounds, but that is a really long way to carry a dog, whatever the size! So, we don’t! And neither does anyone else. 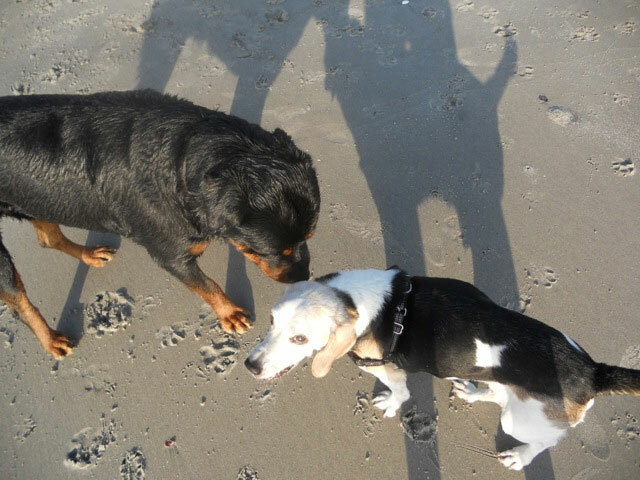 Our beach dog-loving group found this whole situation pretty hilarious, especially since we have a neighbor who runs on the beach every morning with his 100 pound chocolate Labrador retriever! Can you imagine! Sad to say, people often take their little bit of power and use it lord over the minions in their tender loving care. We are hoping for reason to prevail and for the board to use their brains to figure out a workable situation! Maybe, just maybe, we should invite the president of the Board of Directors to join us for one of our Beach W(T)alks! While checking out the progress of the new Canal Expansion up north in Colon (the Atlantic end of the Canal), we made a side trip to the Caribbean coast. In a small coastal town, we discovered a jewel of a zoo: Safaricks Zoologico. 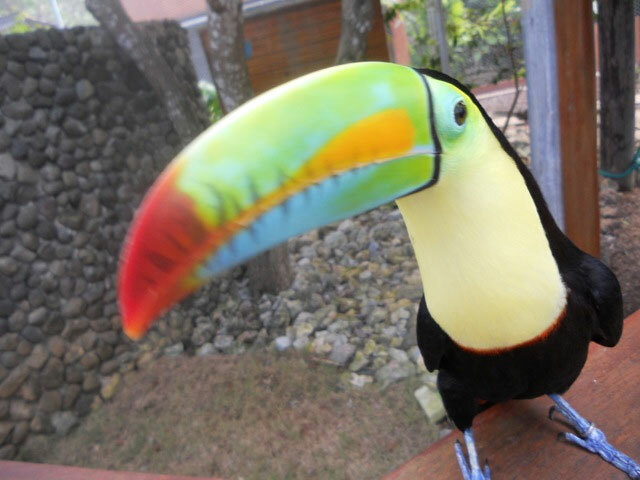 This zoo exists for the purpose of rescuing and rehabilitating orphaned, injured and abused animals, from beautiful toucans, like the fellow here, to ocelots and monkeys. As you tour the zoo, your guide will share each animal’s story. This place has Panama’s largest walk-through aviary, beautiful botanical gardens and wildife from the Caribbean coast of Panama. You can get a peek at this place on their website: www.safarickszoo.com. As time goes on, people are becoming more and more interested in investment in agricultural projects, especially when they actually own the land. Simply said: People must eat and there is no more land being made. We have had many inquiries from folks interested in the Mango Farm we have featured and some of the more fortunate folks have either already purchased or are in the process of reserving their farm purchase. This Mango Farm is very close to being sold out! Are there other possibilities for investing in agricultural projects? Sure. In fact, I have been diligently investigating opportunities in coconut plantations, rubber trees and hardwoods, such as teak. 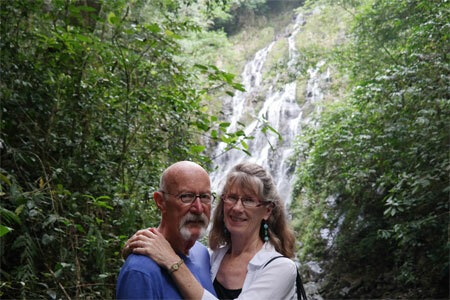 Investments in teak wood plantations in Panama can facilitate your immigration, if that is your goal. Considering the world economy and population growth, we feel investment in agricultural projects provides a win-win situation. Contact us for more information on the Mango Farm or other agricultural possibilities: fpb@anamericaninpanama.org.